There are always so many things to give someone for Valentine's Day, but they're all the "same old, same old." Haven't we all given enough flowers and candy? How about a gift that says you really care? 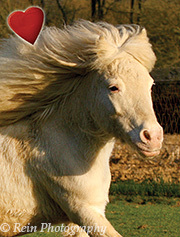 Our suggestion, of course, is A Mylestone Valentine Gift Sponsorship - it's unique, lends a helping hand to beautiful rescued horses who need support, and speaks of your having a pretty big heart, yourself. This year we are featuring five horses who have recently lost quite a few sponsors and are in need of a little extra sponsorship love - Jiminy, Scout, Lucy, Woody, and Jackson. People tend to think that because our big, handsome Scout is our mascot, he must have plenty of sponsors, but that may be just why he doesn't have very many! Won't you give the very special gift of a sponsorship this Valentine's Day? In your Valentine Gift Sponsorship package, your recipient will receive: a special Valentine's Day card announcing your gift, a certificate of sponsorship, plus a photograph and short biography of that rescue horse, all sent by Priority Mail to ensure a perfect delivery. A Valentine's Day sponsorship is a one-time donation that you can pay for by mail or through PayPal with all major credit cards or your own PayPal account. 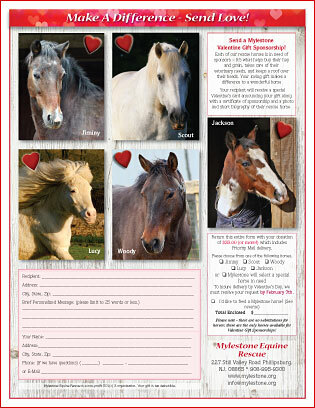 Perhaps you'd like to be the horses' Valentine - and give them something special just from you. Choose from grain, horse treats, Safe Starch hay for those who need it, or even special shoes for some of the horses. Download the flyer for more details. 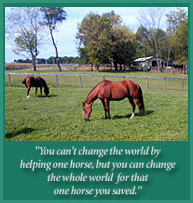 Just remember, these donations are your gift to the horses only - not a gift for someone else. To order your special Valentine's Day Gift Sponsorship, please download and open our Valentine's Gift Sponsorship form available here in pdf format. Please print it out and send the entire form along with your donation of $35.00 (or more, if you wish) per Gift Sponsorship and/or whatever you may have chosen to feed the horses. If paying online through PayPal, please open the Valentine's Gift Sponsorship form so you know what information Mylestone requires, and be sure to include all that information when you complete your donation with PayPal or e-mail us separately with that information. Click below to pay with PayPal. Want to know more about the horses featured in this year's Valentine? Just click on the links below. If a horse is chosen other than those available on the flyer, we will select one of the horses above and send it to your gift recipient on your behalf. Thank you for understanding.